A group of agricultural professionals from Haiti visited the University of Illinois campus during September to learn best practices for developing standardized experimental procedures, phenotyping, and selecting genotypes to optimize the production of maize (corn) in their country. “Corn is a staple food in Haiti, but most of the corn they eat is not actually grown in Haiti; they rely on imports and donations. Our goal is to enable these professionals to find the best suited cultivars to grow in Haiti considering the limitations their farmers experience, including low levels of nitrogen and water,” explained Dr. Martin Bohn, associate professor and corn breeder in the Department of Crop Sciences. The focus of the week-long training was on variety trial setup, management, evaluation, and statistical analysis. The visitors learned how to draw useful conclusions from the data and how to report the results in ways farmers can use. The group of 14 agricultural professionals included men and women from all over Haiti and from various backgrounds including governmental organizations, universities, and the private sector. “It is most important for them to learn how to implement standard operating procedures for conducting experiments and how to get first grade, accurate data. We stressed how to recognize the critical steps in the process for diligence and accurate work,” said Bohn. The group worked both in the field and in the computer lab. 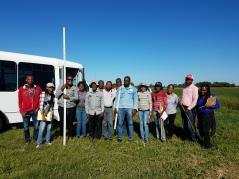 For example, they visited ACES’ South Farms for training on phenotyping, including gathering plant height, ear height, leaf characteristics, and then moved to the computer lab for data entry and analysis. The group also participated in an organic field day in Wisconsin. This field day was organized by the ACES’ National Institute of Food and Agriculture project “Participatory Breeding and Testing Networks: A Maize-based Case Study for Organic Systems” with the goal to connect organic farmers with public and private corn breeders. Upon return to Haiti, the trainees will implement evaluation trials using the standardized procedures they learned at Illinois in target maize production areas. Bohn will visit Haiti later this year to evaluate the ongoing trials and train the researchers on how to use the latest in phenotyping technology, which rapidly measures multiple parameters. Ultimately, the best performing genotypes will be selected for suitable corn production in Haitian conditions. The visit and training was funded by the United States Agency for International Development (USAID) as part of the Support to Agricultural Research and Development (SARD) project led by the University of Florida. SARD aims to strengthen the human and institutional capacity in Haiti to help farmers and agribusiness gain access to better information, technologies, and services. The project works closely with the International Maize and Wheat Improvement Center (CIMMYT) to identify the maize cultivars best suited for production in Haiti.